Today is Monday, a very Monday Monday actually. So I've been spending all day thinking about and drinking coffee. And I feel like coffee goes with brunch. And there's something so fun about a brunch wedding. I'm laughing at myself, though, because Pete and I had a stretch where we brunch quite a bit -- and when we went, I never ordered coffee. I would have coffee in the morning, go to church, then meet him at brunch. But a brunch wedding has to have coffee. And a few other brunch necessities because what would a brunch wedding be, really, without a white powdered doughnut cake? That's just one of the items in our post to help you throw the perfect brunch wedding. There are a few things to keep in mind when planning a brunch wedding. The timing of your wedding is really important. You want to have it early enough for brunch but late enough that anyone who may want to go to Sunday mass can make the ceremony and reception. Plus, if you want to get married at a church, some may not even do a ceremony early enough for a brunch wedding. 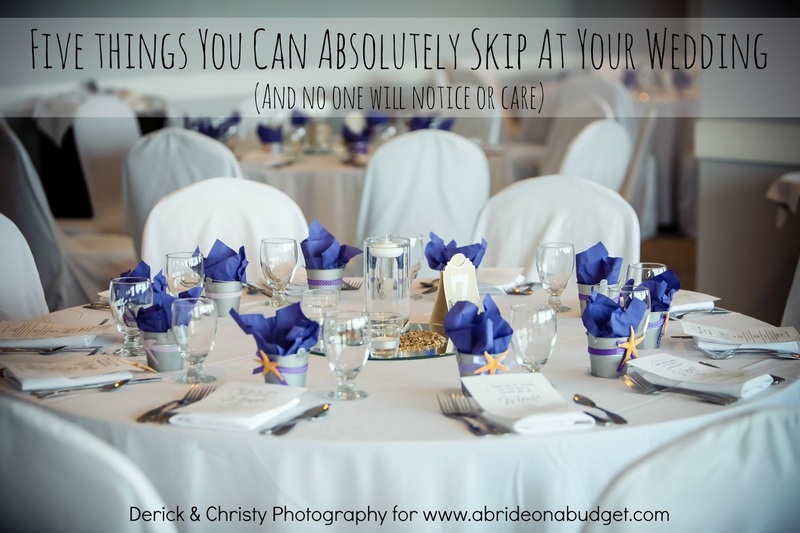 Also, a Sunday wedding may save you a little on the venue (our venue was only $1,000 different between Saturday and Sunday), but you don't have to have a Sunday brunch wedding. If you want, you can have a Saturday brunch wedding. That might be a little easier on your guests because a Sunday wedding that runs late might mean guests who have to work Monday morning will duck out a little early. And, a brunch wedding (or really, any afternoon wedding) comes across as more casual than an evening wedding. If your attire isn't casual, you'll want to communicate that to your guests. 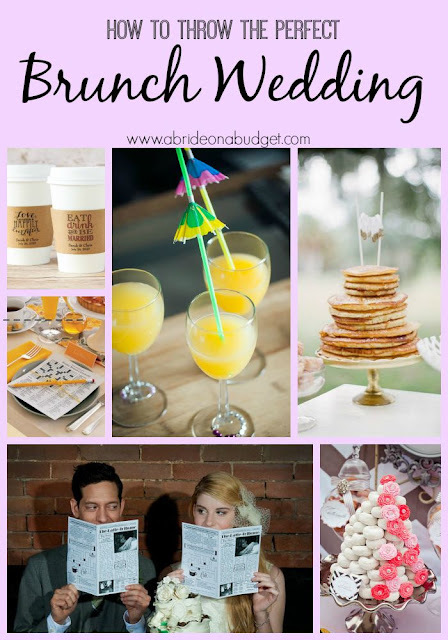 You can have so much fun with your brunch wedding drinks ... and save a bit of cash without your guests even noticing. 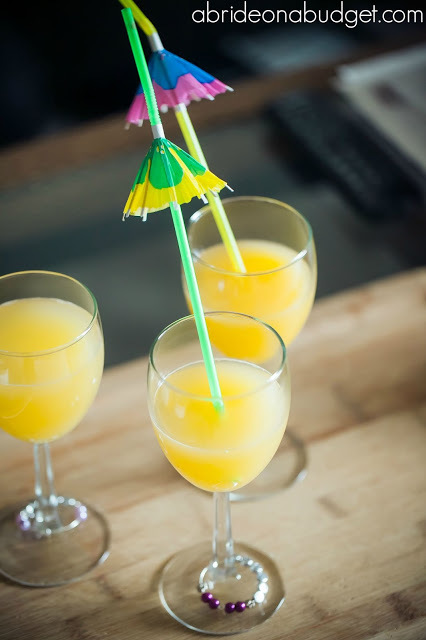 Almost everyone loves mimosas at brunch, so put together a mimosa bar. I had one for my bridesmaids with orange juice and champagne, but you can set one up with champagne and multiple fruit juices. You can also set up a Bloody Mary station with all the fixings (like celery, horseradish, etc.). Your guests will love these action stations and you'll love the fact that you don't need to have a full liquor bar available. Plus, people don't really get bombed during brunch, so you'll need less beer and wine (if you choose to offer that too). Your brunch wedding menu can be so incredibly fun. You can have a full omelet station (make sure to have everything from bacon to cheese to tomatoes for your guests to mix in). If you want something that doesn't require an attendant, you can have a waffle bar. Your passed hors d'oeurves can be so fun too. Just look at those cute yogurt parfaits. There's yogurt, granola, and a raspberry up top. Just be sure to serve them with mini spoons so your guests have a way to eat them. Be sure to add personalized monogrammed tags to them too for a nice touch. If you want something unique to eat, try these french toast dippers. You serve a piece of french toast with a shot of syrup. Your guests dip the bread in the syrup and enjoy. We actually went to a wedding where the couple had grilled cheese dippers, so a triangle of grilled cheese served with a shot of tomato soup. It was so good, really fun, and definitely stood out. 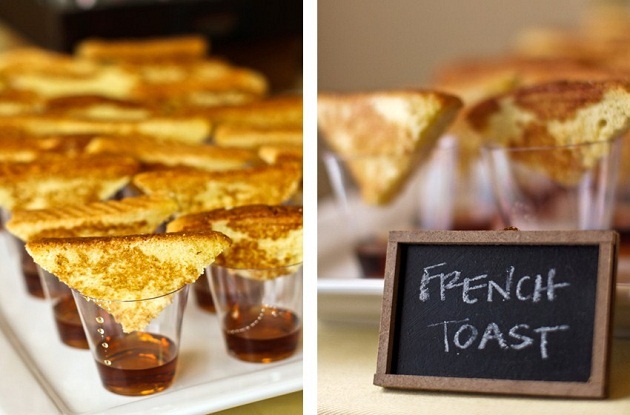 Your french toast dippers will do the same with your guests. And, honestly, you want to plan a few unique things so your guests will always remember parts of your wedding. If you have a bunch of action stations, it might take a while for your guests to get their food. Give them something to distract them from waiting, like these super cute crossword puzzles. You can make them with clues about yourself, your city, or just general knowledge. Plus, they're perfect. 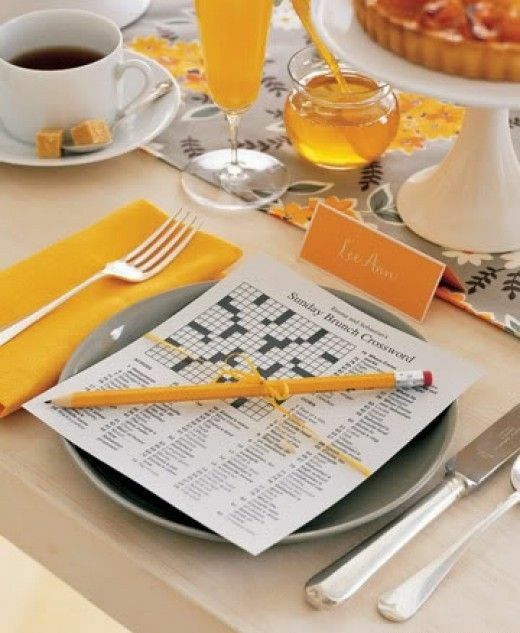 Who doesn't like to do the Sunday crossword during brunch? 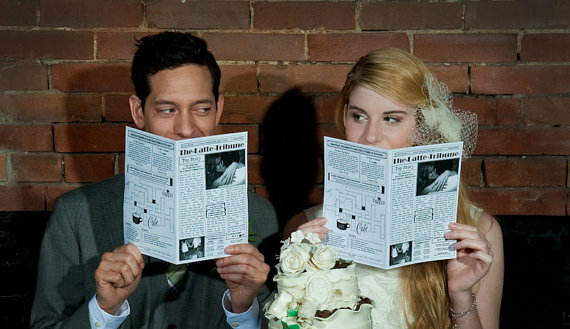 Speaking of the Sunday paper, these unique mini newspaper wedding programs are adorable. They're completely customized. 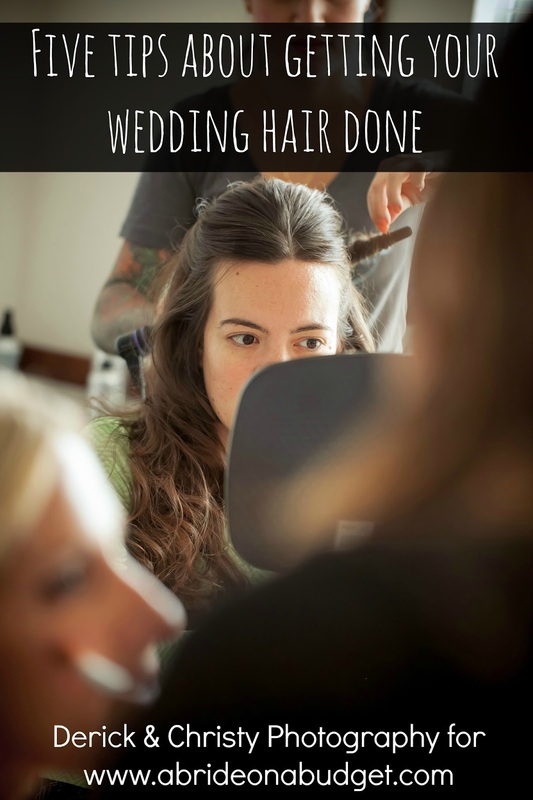 You can add the story about how you fell in love, your proposal story, a who's who of the bridal party, and some fun photos and games. Don't forget to dress your tables for a brunch wedding too. 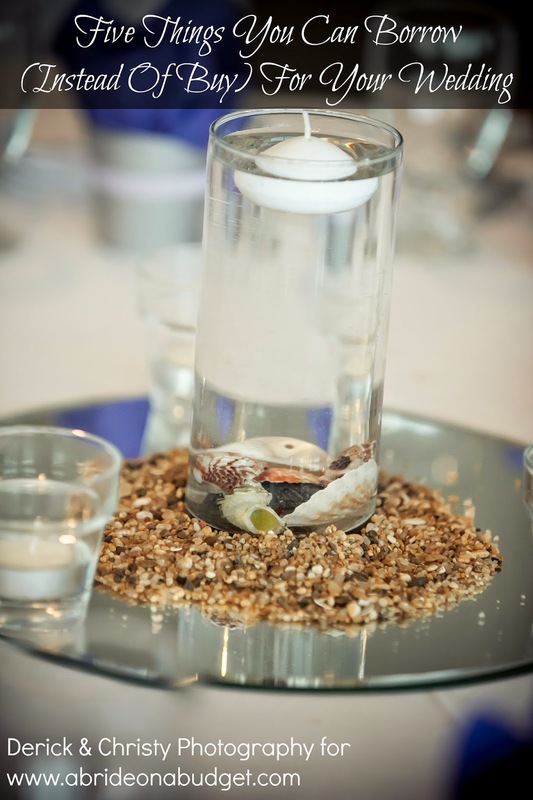 Check out these cute centerpieces. Now, if I was making them, I would add coffee beans to a coffee cup (I feel like that's a big missed opportunity here). Light a tea light in the center and the smell of coffee will fill the room. But that DIY is so easy! 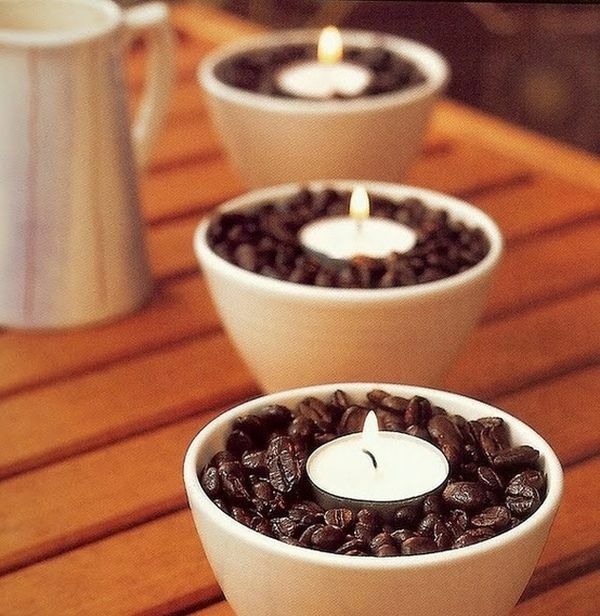 Fill a white coffee mug halfway with coffee beans. Put a tea light in the center. Fill to the top with coffee beans. 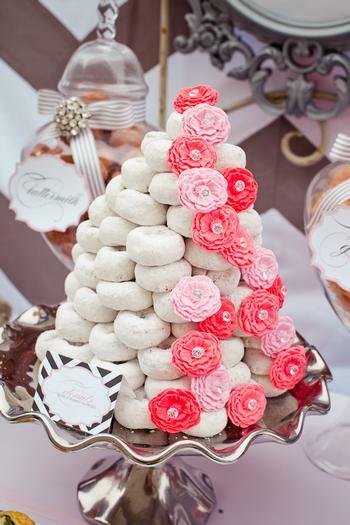 This powdered doughnut wedding cake is the exact reason I think a brunch wedding is such a good idea. I mean, just look how incredibly adorable that doughnut cake is. You can still have a full wedding cake that you cut and feed to each other, but this would be such a fun side item. Plus, who doesn't look at this and think brunch wedding? Stack the doughnuts, add some sugar flowers, and you're good! Not into the doughnut cake? That's okay. There are so many other round objects that will make a great brunch wedding cake. Try pancakes. Or waffles. Or Nutella-filled crepes. Yum. The key to one of those less visually-stunning ideas (read: golden brown) is to have a really cute cake topper on them. You want something to wow your guests and have them look, and a stack of golden brown waffles might not be it. And coffee. We can't forget about coffee. That's how this whole post started, right? You can design personalized coffee sleeves, which are adorable and practical. Put a cute saying and your wedding date on them and they really dress up your coffee mugs. 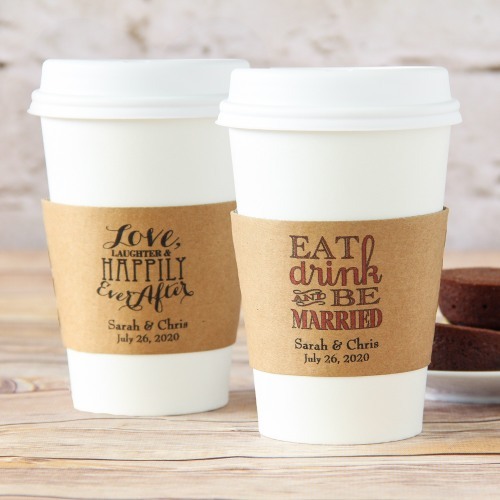 Personally, I would purchase a ton of reusable travel cups, add these coffee sleeves to them, and have those be your wedding favors. If you want a favor that's a little cheaper (but equally as sure to be taken at the end of the night), go with personalized K-Cups. I'm sure you'll have coffee in pots at the wedding, so your guests can drink that then take these K-Cups home with them. You can put a saying and your wedding date on them and your guests can think of you next Sunday, when they're home, enjoying your wedding favor while doing their own Sunday crossword puzzle. 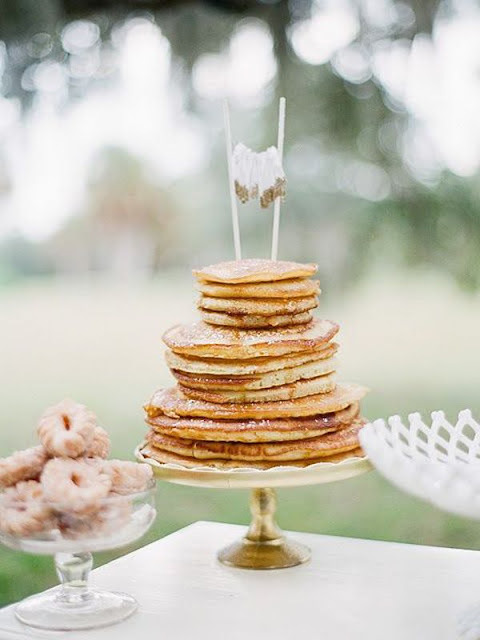 BRIDAL BABBLE: What do you think about having a brunch wedding? 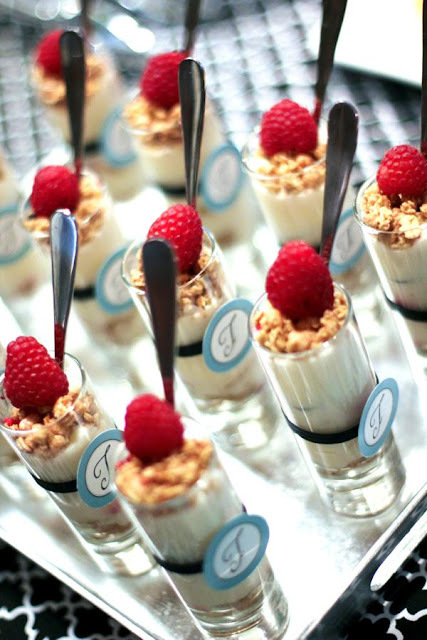 Lots of cute ideas here for a Wedding brunch! 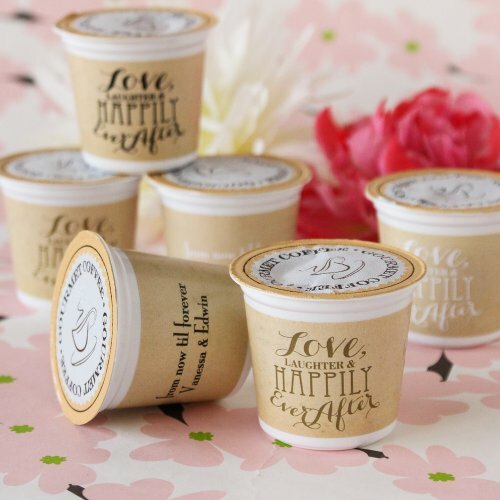 Love the Eat, drink and be married cup sleeves! This is so awesome, what a lovely idea. Everything on the menu is just right and looks classy. So creative, I would love to make that. I don't know anyone getting married, oh well. . . So many wonderful ideas! Lots of them would be perfect for any kind of brunch event or party. yummm both dippers sound delish and could be used at so many parties! Love the idea of the personalized k-cup - would that be totally fun? Just to let you know I call dibs on ALL the yogurt parfaits! Great ideas for a wedding brunch. The photos are awesome...I love the food!